Do more with the HP t420 Thin Client, an affordable cloud computing solution that delivers trustworthy reliability and easy deployment and use. More bang for your buck - Get your choice of essential operating systems, support for VoIP, Microsoft Lync1 , and Unified Communications tools, and value-added integrated software from HP that helps you deploy, manage, and optimize your new systems. Solid reliability - Plan ahead with reliable flash memory storage and a fan-less design for ultra-quiet deployments. Choose a Global Series model and custom image to help ensure worldwide consistency. Rest easy with a two-year lifecycle and three-year limited warranty. Place it where you need it - Install throughout your business—the modern 0.88 liter form factor complements and fits into a range of compact work spaces, and the integrated VESA mount enables mounting on a flat surface, or directly behind an HP ProDisplay. Easy customization - Tailor your installation with the operating system of your choice—and enjoy simplified setup, deployment, and maintenance with HP Device Manager, a software tool available exclusively for HP Thin Clients. Questions about the HP t420 Thin Client? We can help. For more information about the HP t420 Thin Client, or any of our products and services, call us at 1.800.457.8499 or email us. 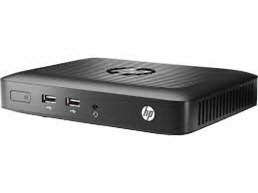 Order your HP t420 Thin Client today. Order your HP t420 Thin Client now. Your purchase order, with credit approval, is welcome, as well as all major credit cards, PayPal and Google Checkout. Remember, you'll get FREE technical service with every product you buy from Vecmar.